Construction crews level dirt at a bridge replacement project on U.S. Highway 56 at Four Corners, preparing the road for a projected reopening on Friday evening. The route has been closed since March 15. SCRANTON—A portion of U.S. Highway 56 that has been closed for three months is set to reopen Friday evening, weather permitting. The highway has been closed since 9 a.m. March 15 for the replacement of a box culvert located under the U.S. 56 roadway at Hundred Ten Mile Creek, located one half mile west of the U.S. Highway 75 interchange. According to a press release from Kansas Department of Transportation, sometime during the evening hours of June 10, the bridge replacement project will be completed and reopened to all traffic. Finishing work, including seeding, will be completed after the road is reopened. During the closure, a marked detour was provided with traffic utilizing U.S. 56 through Burlingame to Osage City and then back to U.S. 75 via K-31. Bryan-Ohlmeier Construction Company is the primary contractor on this $214,227 bridge replacement project. The Kansas Department of Transportation urges all motorists to be alert, obey the warning signs and “Give ‘Em a Brake!” when approaching and driving through the project work zone. 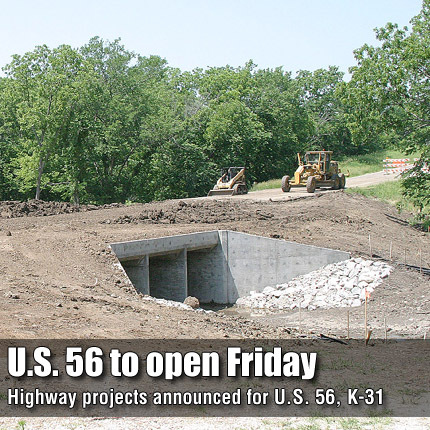 For more information on KDOT projects, contact Kimberly Qualls, Northeast Kansas Public Affairs Manager, at (785) 640-9340; Earl Bosak, Osage City Area Engineer, at (785) 528-3128; or Steve Baalman, Field Engineering Administrator, at (785) 296-2291. Highway projects announced last week ensured that road cones will be commonplace throughout the county for months and years to come. Topping the list of area projects is a $14 million plan to reconstruct seven miles of Kansas Highway 31 between Osage City and U.S. Highway 75. The modernization project would remove hills and add shoulders to the seven-mile stretch of highway. “Local input was a significant factor in the selection process of these projects, along with engineering considerations and economic impacts,” said Kansas Transportation Secretary Deb Miller. Construction on the project is scheduled to start no sooner than 2014, with further information released as the project nears. “These were just announced, and we don’t have specifics yet,” said Kimberly Qualls, Kansas Department of Transportation (KDOT) public affairs manager for northeast Kansas. Qualls noted the importance of the project being selected. “It says a lot for it to rise to the top through the consultation and regional process to be selected,” Qualls said, noting planning and funding would have to be approved before the project would be let to bidders. The project was announced at a press conference June 3 at Kansas Speedway, where Kansas Governor Sam Brownback introduced $8.8 billion in projects, including improvements to U.S. 24 in Shawnee County, interchange improvements in Lenexa, and the completion of the South Lawrence Trafficway, connecting U.S. 59 to K-10. KDOT also announced last week a resurfacing project for U.S. Highway 68 between U.S. 75 and the K-268 interchange, which was set to begin June 2 and be completed on June 10. The resurfacing project will smooth the road and fill cracks that can shorten pavement life. The road will be coated with a thin layer of specially-modified asphalt. New pavement markings will be applied to the entire resurfaced roadway. According to the press release, crews will work daily, Monday through Friday with an occasional Saturday during daylight hours. Traffic will be directed through the project work zone via flaggers and signage and drivers should expect delays of up to 15 minutes. When drivers enter the project work zone on K-68 from adjacent roadways, they must not enter onto either highway until they are directed by the flaggers. There will be a 10-foot lane width restriction throughout the project during daylight work hours. Blevins Asphalt Construction Company Inc., of Mt. Vernon, Mo., is the primary contractor on the $227,698 resurfacing project.